Today I found out twelve ways to remove a stripped screw. We’ve all been there; trying to void a warranty or otherwise take something apart and you go to take that one last screw off and invariably it strips. Now what? You can either A: Think Hammer… really, really big hammer; or B: Read the list below and pick the method that seems easiest to you on how to remove a stripped screw or bolt. Have a Dremel or equivalent tool? Use the Dremel to cut a notch in the screw head. Now take a flat-head screw driver and try and unscrew it using the notch you created. If you happen to have a drill and some drill bits handy, drill a small hole in the center of the screw. No need to drill too deep. 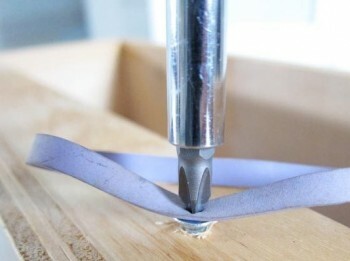 The idea here is just to drill a small hole to allow your Phillips (cross head) screw driver to seat deeper in the hole to help it catch better when you turn it. 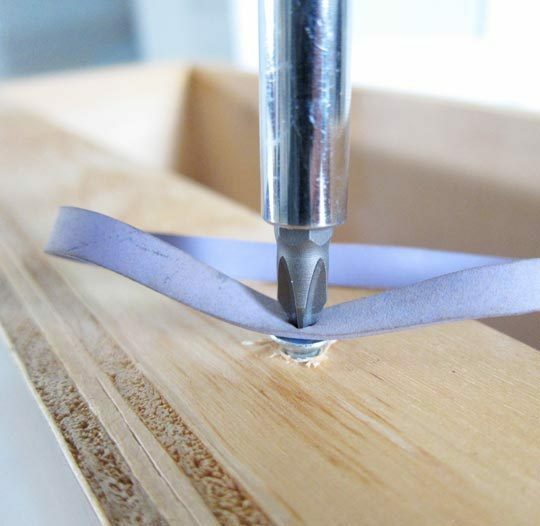 If you happen to have an “easy-out” screw extractor, this is by far the easiest method. Works pretty much every time and with very little effort. They aren’t that expensive and will save you loads of time messing with stripped screws in the future. Use JB Weld or equivalently super strong “welding” adhesive to attach a nut to the screw head. Pick a nut that is about the same size as the screw head or at the least such that the diameter of the hole in the middle of the nut is smaller than the diameter of the hole in the screw. Now place the nut centered on top of the screw. Fill the hole with JB weld, being careful to not let it run everywhere. If the nut is flush on the screw, this shouldn’t be a problem. If it can’t be flush, use some sort of quick drying temporary gasket or the like to seal around the edges so that the JB weld doesn’t get everywhere, but rather just stays in the hole. Now let it dry the recommended time. Once it has hardened up, use a socket wrench on the attached nut to remove the screw. Got a sufficiently wide rubber-band handy? Place it on top of the screw head then try to unscrew the screw slowly pushing really hard. Sometimes the rubber will give you the extra grip needed to get that screw out. If you are handy at welding and don’t want to wait for the JB Weld to harden, take a nut and place it on the screw then weld the nut to the screw by welding along the inner part of the nut. Now simply remove as in #5 with a socket wrench. If you’ve gotten the screw partially up and the head is exposed, get a pair of needle-nose clamping pliers or at the least try a pair of non-clamping needle-nose pliers. Many a time my trusty needle-nose clamping pliers have got me out of a “stripped screw” situation. A slightly more risky method is to carefully drill the head off the screw. Try not to drill deeply, you just want to take the head off enough to be able to remove whatever piece you are trying to remove. Once the head is off and the piece is removed, enough of the shaft of the screw should be exposed (assuming you didn’t drill it too deep); now use needle-nose pliers to get the shaft of the screw out. One of the simplest things to do is if it is a Phillips (cross head) screw, take an appropriately sized flat-head screw driver and, pushing as hard as you can, attempt to remove the screw this way. Often there is plenty of grip available for a flat-head screw driver of the right size in a stripped cross-head screw. If this doesn’t work, combine this method with the rubber band method in step 1. Another simple method is to use a Phillips screw driver that is slightly too big for the hole. Push down hard and tilt the Phillips at a slight angle and turn. For a minorly stripped screw, this often works. Depending on how fragile the thing you are working on is, you can also try taking a hammer and tapping your screw driver into the screw. If the metal was soft enough to strip in the first place, you will often be able to hammer the screwdriver into the screw head enough to give it a firm position for unscrewing. Obviously this method is no good if what you are working on is fragile. If you’ve gotten here and none of the above has worked, it may be time to get out your trusty old over-sized hammer and simply kill the screw… Kill it dead. Collateral damage to the thing you are working on be damned! How to remove a stripped screw. There’s a tool called an impact driver. It works best if you use it before you strip the screw but the down-force of the hammer blow happens at exactly the same time as the driver tries to turn and often the combined shock moves a reluctant screw. Just want to say your step #1 is awesome – worked for me the first time. thanks!! After trying several methods, no. 12 worked just fine. As an added bonus, I got to learn how to repair sheetrock. Hey guys I just want to let you know that the rubber band did not help with my totally stripped out tiny iphone screws. I’ve also tried JBWELD glue Eproxy. But let me back up, my first helpless trial was indeed rubber band, why not its free lying around the house. Second I tried my drill bits since I though it would be the same as drumel? Not good, got the gut to hammer it with screw driver, nope not working. So I went to Acehardware store know some of the ideas will not work, I’d ended up buying just about $40 worth. This include Screw Extractor, JBWELD glue, finally Drumel. I tried all three in this order and guess what, drumel works!! Thanks, I should have tried it first but oh well, now I know…. What the heck is a “drumel”? Mike, I believe “drumel” is a misspelling of “Dremel,” a brand of hand-held rotary tool. It’s sort of like the drill your dentist uses, only obviously not as expensive as his is. It will hold small drill bits, small grinding bits, small sanding disks, and so on. Your step 5 with the rubber band worked perfect, thank you! …and the next 12 ideas are…? Here’s one that just worked for me. Take wire cutters and use them to put grooves in the side of the head. Keep the wire cutters in the grooves and turn enough to unstick the screw. I got as far as step 12 (missing out the welding stuff and the screw extractor as I didn’t feel like going shopping) but wasn’t sure just how to go about killing it… also tried wire snips, mangled it to the point where I had something my needle-nosed pliers could grab! Probably not great for the tools but finally got the $#@%er out! It was a 1950s flat head with a rusted thread that was soft enough for the head to strip but not soft enough to drill the head out (at least with my skills + tools) – had spent about half an hour trying. Now, that is a new one. I’ll add it to my list for next time. The welding idea is not the best option for removing studs and screws unless you remove any coatings the metal may have on it (I.E. zinc, nickel etc). If you don’t remove these metals they will contaminate your weld. Also, welding changed the temper of the metal. usually this will make the metal around the weld softer and decreasing its tensile strength. The metal needs to be heat treated to give it a high tensile strength. I read this great article and use a combo of the concepts. I filed the round head flat on two sides and used a small socket over the screwhead to remove the screw. Dremel with flat-head works every time! Mmm, no. Not if your screw is down in a small space where that tool won’t reach! I love the last step…tried it out too 😉 and while my computer now lay in pieces at my feet, pieces of hardware dangling from my hammer, I have to say…it was worth it! i’m replacing the screen on my iphone 4s, when i went to take it apart, i stripped 2 screw heads and can’t get them out at all. Any ideas on how to remove those screws? FYI: these are super small screws. and access with a dremel tool on one of them is impossible. Tip #5 was great! Worked like a charm! Thanks! Did you use a wide rubber band or anything special? I am on day two battling a stripped screw. I used these (Japanese!) pliers with jaws that can removed stripped/siezed screws…. That link doesn’t seem to work anymore, but I seem to remember once seeing the pliers you mention.. I’ve used regular locking pliers (Vice-Grip) before, but I think the pliers you mention are even better. Thanks for the tip. I’m going to look for them. I am blown away by the rubber band trick. Common supplies and super easy. Thank you!!!! Thanks for all the helpful advice. I tried the rubber band and a few of the other suggestions. Eventually I used a flat screwdriver and a hammer to knock the cupboard door off the hinge. I was able to attack a vice grip to the screw head and twist it off. Rubberband, man! Now to figure out how to get the fan in my ceiling fan working again. I’m going to see if the black wire came loose. I can bring home the bacaon!!! I was just getting ready to “borrow” a wrecking ball from the city’s lot –then voluntarily admit myself into a psychiatric facility for sedation. Not being a member of the throw-it-out-and-get-a-new-one elite…I was prepared to spend the rest of my life proving the apparently annoyed worker that I do not have to live without a kitchen sink over one SCREW. Number two. Took less than a minute. And I REALLY appreciate the “we’ve all been there” comment. I am not foolish, reckless, nor inept. I stripped a screw. You are hilarious—LOVE your humor!!! It is not a “Flat head”! The correct name for that kind of screwdriver is “Slot” reffering to the slot in the head of the screw for which it was designed. Lot’s of people call them “flat head” as well, but if you’re going to be correcting people about the name of something, you should probably get it right yourself to avoid looking like a total moron. It is not a “Slot”! The correct name for that kind of screwdriver is “SLOTTED.” Moron. To the author: The rubber band trick worked like a charm. Never would’ve thought of that one. Thanks. A little bit of valve grinding compound, which you can buy in most auto parts stores, works wonders when applied to the head of the screw or tip of the Philips. You’ll be surprised how well it works. A must-have for any toolbox. The time: about 40 years ago. The place: under a 1964 Pontiac Catalina, trying to loosen a rusted exhaust pipe bolt from the exhaust manifold. I had up rounded off the head of the bolt with the ratchet (I probably used a 12-point socket instead of a 6-point) and thought I’d try an “E-Z Out,” which is like a left-handed drill bit. I tried drilling a hole in the head of the bolt to screw in the E-Z Out but it was too strong for the drill bit; I couldn’t drill a deep enough hole. I tried penetrating oil, heat, hammering, and drilling. I finally put a pair of 10″ Vise Grips on the bolt head, sticking straight out from the bolt parallel to its shank, then used a smaller pair of Vise Grips to tighten the knob on the larger pair. I was able to put a large wrench on the jaw of the Vise Grips and, bewteen the vibration of more hammering and drilling, and more heating and penetrating oil, I finally got the bolt to move. Using the smaller Vise Grips to tighten the knob on the larger pair was the secret: before I tried that I couldn’t get the larger pair tight enough to stay on the bolt when I put the wrench on them. I carried that bolt in my pocket for many years to remind me that just about anything can be overcome if you put your mind to it! Of all the 12 ways,none said which direction.clockwise or counter clockwise to turn to get a screw out. Well, I’m still at it. I’ve tried all of these tips that were applicable to me save welding (no experience there.) Went out and bought a set of screw extractors as well as some JB Weld. Had my last hopes pinned on the JB Weld, but after waiting a full day for it to cure, today the bolt twisted right off the top of the ($#@!-ing) screw instead of loosening it. (And believe me, I prepped it well–cleaning, sanding, degreasing and drying before adding the JB Weld.) The screw I’m trying to remove is flat, countersunk…in the top of my bathtub drain stopper. The whole setup’s very old (probably the original from ’50s.) Looks nothing like anything I’ve seen on YouTube or anywhere else on the web. I decided to forget the screw & just cut the stopper off, but can’t do that with my Dremel, as there isn’t enough clearance underneath to reach the metal piece it’s attached to. Tomorrow I might try cutting the edges off in small pieces…hope my Dremel can keep up with all that cutting! But back to the subject matter: your tips are very good & useful…they’ll come in handy for future projects. I guess I just have the most stubborn drain screw in the world! Hi Gianna, I have only stumbled upon this site today so you have probably got the screw out by now. You could have tried spraying it with Q20 and leaving it to soak in. Sounds like this screw could be rusted hence the difficulty. Once the Q20 has penetrated beneath the surface you could try tapping it to loosen it and then remove it. Instead of needle nose pliers, I use a small wire cutter. It was sharp enough to cut into the screw head and give me a good grip as I turned the screw loose. Apparently you think that there is only ONE kind of situation that is referred to as a “stripped screw”. Actually, what you are talking about is a “stripped screw HEAD”; there is also the situation of a “stripped screw THREAD”. The stripped thread almost always happens only when a machine screw is used. You turn the screw, the thread strips. It will turn forever now, but since the thread is not gripping, it won’t come out. A “machine screw” is of even thickness for the whole length of the shaft, has evenly spaced thread, and screws into a threaded metal nut or hole. Either the screw can strip; or the nut/hole can strip; or both. I’d like to see some suggestions f or handling this kind of “stripped screw”. A flathead screw need not be a slotted screw; neither does a slotted screw need to be a flathead – it can be round-headed, or even bolt-headed. Hi Scribblerlarry, you can put a piece of prestik on the tip of the screwdriver and then gently turn and pull back gently while turning the screw and this should assist in getting the screw out. Another method is use quick setting glue and apply to tip of screw driver and insert into screw and hold in place while it sets. Then remove same as prestik method. Spot weleding the screwdriver onto head will also work but might be a bot more messy. I can’t believe it wasn’t mentioned, but if the said screw isn’t fully sank into the piece, and the head of the screw is still exposed, take your drill, remove the drill bit, and carefully tighten the chuck down around the head of the screw, (needs to be tight) flip the drill in reverse and whammy, unscrew said screw. Additionally, avoid using screws that come with cheap hardware, they are usually made of low grade metal or aluminum and will usually strip if you don’t pre-drill a hole. Thank you so much! This trick finally loosened my nemesis, the screw of doom. Just when I was contemplating just living with a screw sticking half an inch out of one of my shelf brackets, I was able to remove the messed up screw and replace it with a good one. At least I learned why predrilling holes is important. “Stripped Screw”…. A stripped screw to a tool and die maker means a screw having the threads stripped, not one having the head missing, or screwdriver slots of any type mangled. If a screw or bolt is so frozen that the head twisted off, or the screwdriver slot got destroyed when trying to remove them, then good luck with such as the JB Weld, or rubber band. Use a penetrating oil, or WD 40. let it soak around the bolt or screw for a reasonable amount of time….. fifteen minutes or so…..
Now with a hammer, strike a good quality center punch on top of the screw or headless bolt out near the perimeter, then continue to tap the hammer on a now slightly angled center punch in a counter clockwise direction for right hand threads; clockwise for left hand screws, I’ve never had it fail. In the real world of manufacturing, there is no room for failure, everything has to be successful. Thankyou! Rubberband trick worked perfectly for a screw in my laptop! Great replies and a great article. I’d guess the advise would work for 80% of cases. I like one of the previous contributors have a machine screw fitted into a outside deck light. I simple need to open the screwed down cover to replace the bulb. The screw is flush with the casing so can’t use a dremel since this would destroy the outer light fixture. And other time my sprinkler has added sufficient limescale to ‘weld’ the screw and its thread to the metal casing. Any ideas? A little over 50 years ago I had a job in a TV repair shop while working my way thru engineering school. A customer wanted us to work on an old fashioned reel to reel tape recorder. The reel hubs were each held on with single screw in the shaft. Try as we could one of the screws would not budge. Keep in mind the customer would not approve use of some your more destructive methods. Turns out that the suggestion to try turning the screw in the opposite direction was successful. One reel was held on with a cw thread and the other with a ccw thread. Designed that way to counter the reverse torque on one reel that caused it to come loose over time. The really amazing thing was how easy it came out after we had used everything but a herd of elephants screwing it the wrong way while trying to remove it in the first place. I would like to take credit for the “reverse direction” suggestion but humility prevents! occasionally, holding the tip of a soldering gun on the screw head for a few minutes will release whatever is holding it prior to unscrewing. I didn’t have any rubber in here, and the screw was inside a hole. But the corner of a piece of paper did the job. Hope this can be helpful to someone. Removing house numbers to re-paint and the LAST screw was stripped. Used a small flat head and a LOT of pressure and YES it was removed. This is a great site!!! Another handy thing is water based valve grinding compound (About $8 at Napa). It provides a little extra surface and bite to the screwdriver and can salvage some pretty ratty screws–and one jar will last forever. Just try not to get the oil based compound–you’ll be cleaning that stuff up for days. If there is sufficient head left, use a stout pair of diagonal cutters straight down on the outside of the head. Close tightly, driving the blades into the side of the screw head and turn while keeping pressure on the cutters. Valve grinding compound or some pasty material with very fine sand or grit can be placed into the stripped head of a phillips screw and then push the driver hard into head and attempt to free it. The grit will help fill the worn areas and jam up in the gaps between driver and screw. For stripped screw threads, sometimes you can get a blade or slotted screwdriver under the head of the screw and pry upward while turning the screw head (unscrewing) normally with the popper driver. Seeing this many tips, plus all the comments, encouraged me to believe that I could do it! Thanks! After nearly 3 hours, I used a hacksaw to saw a groove in the stripped head, and then put a “slotted” screwdriver into it and hit the top of the slot at a counterclockwise angle using a hammer to get the stubborn screw to move out. Thanks. This was very useful. Oil plus heat then short nose pliers did it for me. 12 worked great for me. Ha I never comment but this is awesome!! I used the one with the rubber band and phillips. Can’t believe it actually worked! Trying to change m iPhone 4S battery, I got one of the tiny Phillips inside totally stripped. (Those mf are working with soft screws to avoid repairs and make you buy a new device >.< ). I tried the rubber band, any other rubbery thing that I found around, a flat screwdriver, a box cutter… even the superglue method. What finally worked was… a nail clipper! Of course, it will only work for screws that are smaller than the space between the blades. Once the screw is a little bit loose, tweezers are the best to take it out and put it back again. Thank you so much. I tried to get a very small flathead screwdriver inside the screw, pushed hard, and it actually came out. You have no idea the relief in me right now. I managed to strip someone else’s screw. I would be dead if it wasn’t for this article. Thanks. step 5 worked brilliantly – minimum fuss too thanks! YEP! Suggestion number 2 works like a charm. Thanks! Very helpful list! One more suggestion: move to Canada where this is unlikely to trouble you again, because few Canadians are stupid enough to use Phillips screws in the first place (since Robertson screws actually work). Why Phillips drivers are so popular in the USA is a mystery to me. Very Useful for me was #10. I used an oversized screwdriver bit with an electric screwdriver, applied downward pressure, and Voila, 2 shredded screws removed. Thank you! Thank you…. after much swearing… Hubby read and found a solution from your list… thank you!!! #11 worked for me. It was a stripped phillips head, and after trying a few other methods, I took a flat head and hammer and chiseled it into the head and it finally turned. Thanks for your good tips! get a flat blade screwdriver, and punch it down into the head. if it fails then rock the flat screwdriver point to point. the points(corners) should dig a channel for it to eventually give enough depth to grip and undo the screw. I put a Phillips head screwdriver into the stripped head and lightly hit it with a hammer until I could successfully turn it. And I got it out. I’ve been looking at that darn thing for 5 years, wanting to fix what the contractor had done, and I finally got it out. Thanks for your advice. Another option for removing larger phillips head wood screws is to use an appropriate sized box/square drive bit. The interior points of the phillips head are usually the first to go, leaving a square depression in the screw head that the square bit fits into nicely. This worked well for me on several stripped out 3 inch #10 screws that were overhead in a kitchen window, making it difficult to apply enough pressure to maintain contact using other options. These are not fixes for a striped screw. These are fixes for a rounded head. 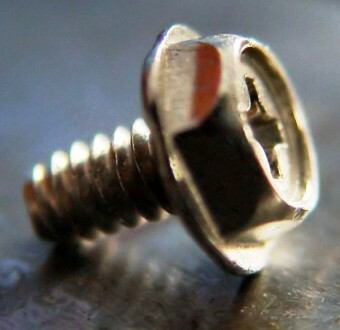 A striped screw has damage to the threads not the head. The hammer trick worked for me, though I’m not sure if it wedged the screwdriver in further or if the screw was just knocked loose enough to remove. Either way, yay! Taking a very small flathead and pushing hard worked for me. Thanks! I just hurt my arms trying to get rusted screws out of some old directors chairs that I am revamping for a client. My arms are killing me and the screws would not budge. I sprayed some w-40 on them and think I will try the rubber band trick tomorrow. I wanted to clean up the hinges with a coat of spray paint but need to get them off first! I’ve often used the Vice-Grip pliers method. The key is to have enough of the head to actually get a good grip. I have a method that never lets me down. Clover(brand) valve grinding compound. FINE works well most of the time . For really stubborn cases the MEDIUM will help. Just put a little ball of it into the top of the screw, use the recommended driver and remove it. The small grit particles will grab on to your driver and the surface of the screw. It WILL come out. this method roughens the tip of the driver. What do you do when the headless screw-shaft will shear off rather than give up the wood? The screw head has sheared off and the rest of the screw is buried in the wood so there’s nothing to grip on to get it out. I have to reuse the same hole because other components of a lock in place mean the replacement lock needs screwing into the exact same place. How do I get out such a buried headless screw? These instructions are all well and good IF your working with wood. I have a screw so tight in place, its a round flat head with a hex head screw tip. My hex heads are unable to get a grip and stripping the screw out. The area is so tight you can NOT get a power tool of any kind in there. I can not even grip it with pliers of any kind. The exact thing is for replacing a turn signal switch on my GMC Sonoma pick up. I got the top one out of the switch by using a hack saw to put a cut across the screw, then a standard flat screw drive was able to get a grip. The other screw ( there are only two) is lower and can not be accessed except by a allen wrench 3.5 mm. The head is stripping…HELP>>>>>I am going crazy right now and out of ideas. Any one? Drill a hole into the stripped screw and get a phillips head that you are willing to discard. Get the strongest epoxy paste you can find and epoxy the stripped screw (now with a hole) to the phillips head. After the epoxy dries, work the screw with the attached phillips head. Thanks so much. I had to remove a stripped screw from my washing machine and finally got it with the rubber band and trying various screwdrivers. Thanks so much. I like this article, it is awesome. Thanks for this article…the grabit extractor looks really good.